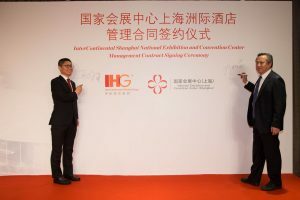 Shanghai, China, December 2, 2015 /ChinaNewswire.com/ - The world’s leading hotel company, InterContinental Hotels Group (IHG), and the Shanghai EXPO Co., Ltd (SEC), announced the development of the InterContinental Shanghai National Exhibition and Convention Center today. The hotel will be an integral part of the National Exhibition and Convention Center (Shanghai) (NECC) — the world’s largest exhibition centre as well as the biggest single architectural complex. Owned by SEC and managed by IHG, the InterContinental Shanghai National Exhibition and Convention Center boasts 543 rooms, a grand ballroom of 960 square metres and state-of-the-art multifunction meeting facilities. The hotel was designed by the East China Architectural Design and Research Institute and renowned design firm HBA to best reflect the understated elegance and modern luxury of the InterContinental brand. It is located at the end of the south-western “leaf” of the clover-shaped NECC, conveniently accessible within minutes’ drive from the Hongqiao Transportation Hub in Shanghai. Being the only hotel nestled within the complex, the InterContinental Shanghai National Exhibition and Convention Center will provide high-quality services and enriching experiences to guests from around the world, whether they travel for business or leisure. Invested in and operated by SEC, the National Exhibition and Convention Center (Shanghai) (NECC) is a national exhibition centre co-established by the Ministry of Commerce of China and the Shanghai Municipal Government. With a total construction area of 1.47 million square meters, the NECC is designed to serve as the accelerator of Shanghai’s growth into an international trade centre. Besides the mega space of exhibition halls, there are office buildings, a commercial centre and the just-announced InterContinental hotel under the same roof, all linked by an 8-meter-high elevated pedestrian walkway. The InterContinental Shanghai National Exhibition and Convention Center is expected to open in the second half of 2016. As a truly international luxury brand, InterContinental Hotels & Resorts has more than 180 hotels, located in more than 60 countries, with local insight that comes from nearly 70 years of experience. In Greater China, the brand has 34 hotels in operation and another 20 in the development pipeline. The InterContinental Shanghai National Exhibition and Convention Center will become the fifth InterContinental hotel in Shanghai after InterContinental Shanghai Pudong, InterContinental Shanghai Puxi, InterContinental Shanghai Expo, and InterContinental Shanghai Ruijin.